If that doesn't work email it to me at: clharlan@dcpmidstream.com and I will post it for you. Take a look on the block exterior just underneath the oil filter, there should be a casting number there that will help identify it. Last edited by lineslinger; 02-27-2007 at 04:36 PM.. Easiest way to tell if it's a S/O is to look at the front of the engine. If you're facing it, look to the right of the timing cover. If there's a pipe plug there, then it's a S/O. Also, it will have pipe plugs on the "humps" on the side of the block. But the plug in the front is the easiest way....and you don't have to crawl underneath a car to check it. Here are some of your pictures of your 427. However, I believe it is not a side oiler but instead a Center Oiler (aka Top Oiler). I also believe it is possibly a 63 -65 production. Brent join in here and tell me what you see. First glance at the front says it's a C/O like you say. It looks like it's missing the pipe plug to the right of the front cover flange. It could be easily confirmed by looking at the side of the block and looking for the "humps" with the pipe plugs that indicate the oil passages along the side of the block. Since this is not working the way I want it to go to my gallery and take a look at the pictures. Last edited by Clois Harlan; 03-01-2007 at 05:30 AM..
Wow, from the side view it sure looks like a side oiler. I'm definitely not an expert by any means, but I don't believe the top/center oilers having the bulges on the side of the block. I'm trying to find a good pic of the front of a block that shows the oil passage I'm referring to. 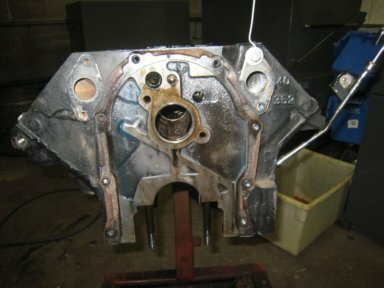 Clois, here's a link to a picture that shows the pipe plug to the right of the timing cover. 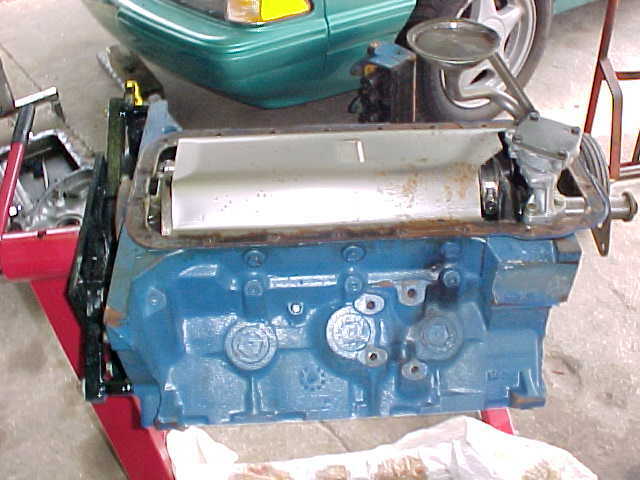 airvolts: Get a copy of Steve Christ's How to Rebuild Your Big-Block Ford. 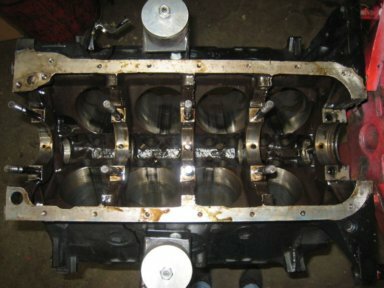 It will asnwer most of your questions about any OEM FE Ford. In this case, pages 30 and 31 cover how to ID a center oiler or side oiler. With that said here are a couple more pix of a side oiler block. Block has just been cleaned. Note threaded holes on the right side of the block between core plugs and cross-bolt holes. Note, also, the boss that runs front to back parallel with the main-bearing center line which are intersected by those holes. This is where the side oil gallery is drilled. Here's a view of the back side of the block during assembly. 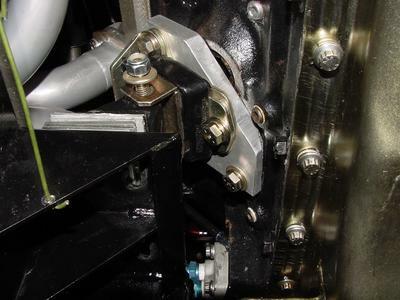 Those two threaded oil-gallery holes to the left side (right side as pictured) of the crank flange confirms it's a side oiler. Center oilers have two above the cam plug. A side oiler has one as shown. Hope the information "overload" helps. Clois did you receive the pictures of each side of the block? Also thank you for posting pictures for me. If anyone has a book that they could look up the numbers I provided I would greatly appreciate it. The numbers and letters you need are the ones found on the pass side front stamped near the #1 cylinder on the block. If your engine was sitting in the car they would be upside down. You are welcome, I went through the same thing a few years ago. By the way I have a 63 427 Center Oiler that puts out 535 hp at the flywheel and it is plenty stout. Mine is being rebuilt/freshened up. Most of the parts that came with the car are fine just needed to be cleaned up. I have ross pistons,edlebrock performer heads and manifold, eagle rods,(2) holly carbs (not sure of the size),crane solid lifter cam, steel crank (which according to the guy building it weighs a ton). I'm not a engine guy so if messed up any of those terms don't shoot me. He is going to replace rings, rear main seal, bearings, and clean up everything. Then dyno and tune it in the car. 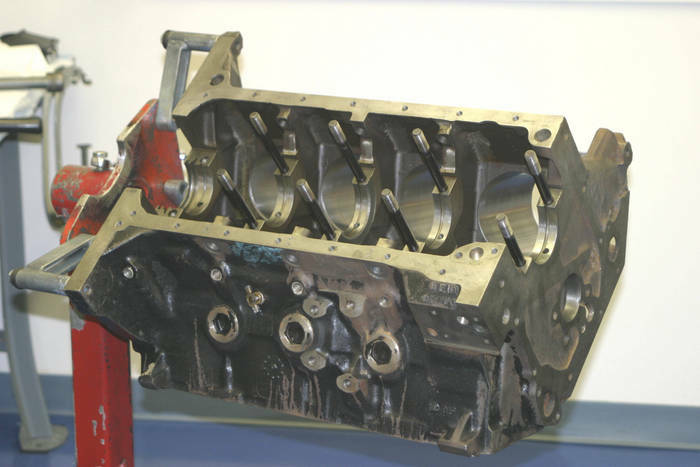 If some C/O's were cast with the humps, then the only good way of checking is to look for the pipe plug on the front of the block near the timing cover. In that case, I don't think Airvolt's block has this.